In this image, captured in infrared light by the National Oceanic and Atmospheric Agency's GOES-East satellite on Nov. 18, 2014, the cold air over the central and eastern U.S. looks like a gray-white blanket. 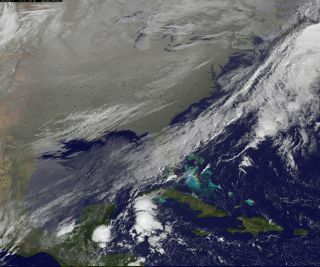 A new satellite photo shows the eastern United States locked in a cold front's icy grip. The region appears to be covered by a gray-white blanket in the image, which was captured in infrared light Tuesday morning (Nov. 18) by the National Oceanic and Atmospheric Administration's (NOAA) GOES-East spacecraft. While much of the eastern two-third of the country is buried under drifts of snow, the "blanket" actually represents clouds, researchers said. Other features stand out prominently in the image as well. "Dozens of lakes behind dams in the Southeast USA stand out as dark spots in a grey landscape," Dennis Chesters, of NASA/NOAA's GOES Project at NASA's Goddard Space Flight Center in Greenbelt, Maryland, said in a statement. "That is because we invert the display of infrared emission to make cold cloud tops appear white, frozen land grey and warm water dark." The new image is a composite. Researchers with the GOES Project overlaid infrared data from GOES-East on top of a true-color view of the landscape created using data gathered by the Moderate Resolution Imaging Spectroradiometer (MODIS), an instrument on NASA's Aqua and Terra Earth-observation satellites. The cold weather has its roots in a low-pressure system, which has brought icy polar air down to the eastern United States and Canada. Temperatures in much of the region are 20 degrees Fahrenheit (11 degrees Celsius) colder than usual for this time of year, NASA officials said. The frigid conditions should continue through Wednesday (Nov. 19), and temperatures should start to rise again Thursday (Nov. 20), they added.